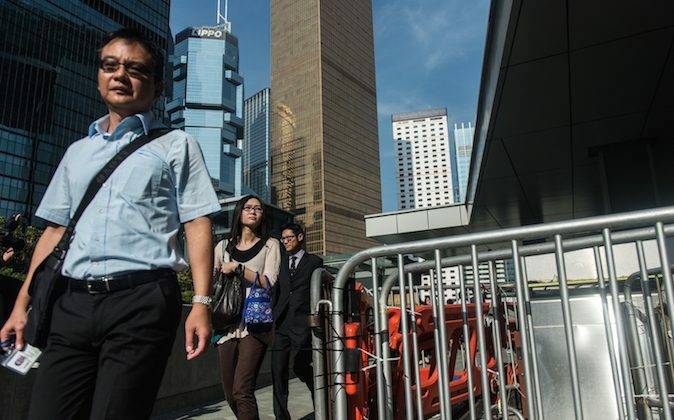 HONG KONG—On Oct. 23, civil servants in Hong Kong took out a full page ad in the Hong Kong-based newspaper Mingpao to support the Occupy Central movement. “We don’t have any proposal for any possible solution. We just hope that the movement will have a happy ending so that people in Hong Kong can enjoy true democracy and social order can be restored to Hong Kong,” the letter states. At the bottom of the full-page ad are pictures of employment I.D.s taken by the civil servants themselves to show their support. The open letter was signed by 1,314 civil servants from 65 different departments. And the cost of the full-page ad, 46,200 HK dollars (approximately US$6,000) was paid for by donations by 55 civil servants. “The struggle for true general election began back in 1988…We are not demanding special privileges, but rather, basic civil rights that are written in the Basic Law,” stated the open letter. “For people who follow the Umbrella Revolution closely, traditional politicians have been marginalized. They cannot dictate the direction that the movement will go,” states the open letter.